The right projector is an essential part of any presentation. The quality of the projector is probably the most important part of any PowerPoint or other visual presentation to an audience of employees or potential clients. To get your point across, whether you are in sales, marketing or training, you need to project a high-quality image. Unfortunately, when presenting at offsite venues such as hotel meeting rooms, the projector provided is often of substandard quality and your presentation will not have the impact it should have. projector and screen that best fit your needs requires careful consideration of the following factors. When choosing a projector, the first consideration is the purpose and place of its use. If you are just going to give PowerPoint presentations or a generic business presentation, you probably do not need the high resolution you would need for large and detailed spreadsheets, or complex architectural or engineering schematics, or presentations with a lot of video content. The quality of the picture depends on the number of pixels on the screen. Presentations requiring fine detail will need at least 1920 pixels horizontally and 1080 pixels vertically on the screen (i.e., HD 1080p) while simpler presentations require a lower resolution format. The amount of light sent to the screen can vary greatly from projector to projector. The brightness of light projection is measured in “lumens”. The larger the room and the greater the natural room light the more powerful the projector lamp needed. Thus, it is important to determine the venue in which the projector is to be used. A darkened room may be able to use a projector with 1,000 to 1,200 lumens, whereas a room that requires light for participant interaction may require at least 2,500 lumens. rating to a Center rating; each is a distinct standard. The reflectivity of the screen is measured as “gain”, which measures the amount of light reflected back at the centre of the screen. Because gain measures the reflection at the central area of the screen, high-gain screens are better for small rooms where the audience is also viewing the centre of the screen. If the room is larger and the outlying members of the audience are viewing from a lower angle, a low-gain screen is probably more useful. Image brightness is determined by both projector and screen. conventionally sized conference room with normal lighting, a rating of 60 foot -Lamberts is recommended. The number of foot-Lamberts needed will, however, vary with the level of ambient light in the room. Throw distance is the distance between the projector and the screen (i.e., the distance the image has to be thrown and still fit the screen). Before you buy any equipment, you probably know the size of the room you are going to use for your presentations. The size of the room will dictate the size of the screen. Most manufacturers have online calculators to help you select the projector that will give you the throw distance that optimizes the image you want, given your space. weigh about 216 grams and will fit in your pocket. 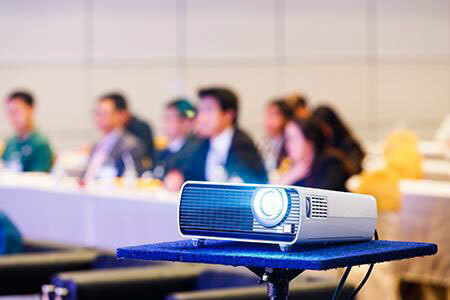 The purchase price for projectors suitable for an office or conferences can range from $800 to $1,800. video as well as the ability to work with PowerPoint , Word, Excel and PDF files. As well as having wireless connectivity, top-end projectors consider the need for connectors for HDMI, VGA, and RJ -45 and RS232 spherical equipment. Projectors are a reasonably inexpensive means of providing sales and marketing staff with the ability to put on a show that enhances the presentation of new products or services. From a training standpoint , quality projections capture the attention of all employees and allow the presenter to encourage interaction. Further, projectors with interactive capabilities allow users to see and participate through larger-than-life images that increase understanding, encourage inclusiveness in project development and potentially improve not only the product or process but also customer satisfaction and the bottom line.